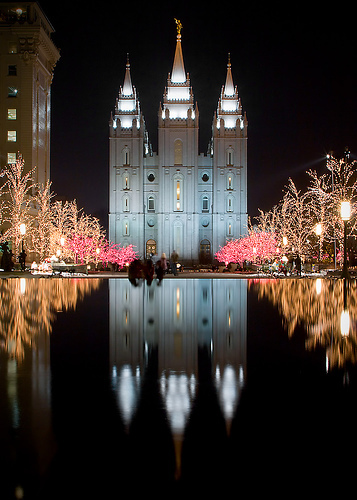 The Salt Lake Temple, dedicated in 1893, was the next LDS temple topped with an angel, and, the first to be formally identified as representing the angel Moroni. This statue was designed by an American Presbyterian sculptor living in Salt Lake City named Cyrus Dallin. 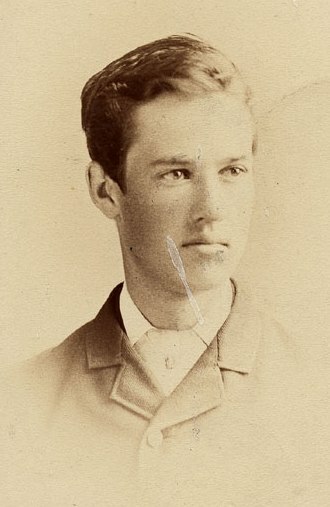 Cyrus Edwin Dallin was born in Springville, Utah, on 22 November 1861. His ancestors converted to the LDS Church in England and immigrated to Utah in 1851. Once there, however, Dallin’s parents joined the Presbyterian Church. As a child he loved sketching and modeling with clay. Eventually he studied art in Boston. When LDS President Wilford Woodruff asked Dallin to create the statue, he declined, saying he “did not believe in angels.” President Woodruff was not deterred. He encouraged Cyrus to consult with his mother, a former Latter-day Saint. The sculptor’s mother felt strongly that her son should accept the commission. When Cyrus repeated he did not believe in angels, his mother asked: “Why do you say that? You call me your ‘angel mother.’ ” She encouraged him to study LDS scriptures for inspiration, which he did. Dallin’s design was a dignified, neoclassical angel in robe and cap, standing upright with a trumpet in hand. The original 40-inch plaster model was completed by 4 October 1891 and exhibited at the Salt Lake Fair. A full-size model was sent to Salem, Ohio, where the statue was hammered out of copper and covered with 22-karat gold leaf. The 12-foot-5-inch statue stands on a stone ball on the 210-foot central spire on the east side of the temple. 1. Millard F. Malin created the 2nd Angel Moroni Statue, placed on the Los Angeles California Temple in 1953 (dedicated 1956) . His angel was cast in aluminum, and stands 4.7 meters high and weighs 953 kilograms. It has Native American features, wears a Mayan style cloak and holds the gold plates in his left hand. You can read a fascinating trivia article about this statue at Keepapitchin entitled “Angel Moroni’s Secret“. 2. 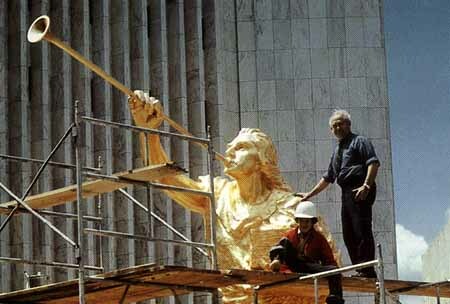 Avard Fairbanks sculpted the third Angel Moroni statue which was placed on the Washington D.C. Temple, dedicated in 1974. This angel was created as a one-meter model which was sent to Italy where it was enlarged, cast in bronze, and gilded. The finished statue is 5.5 meters high and weighs over 4,000 pounds (1814 kg). The Seattle Washington, Jordan River Utah, and Mexico City Mexico Temples each have a 4.6 meter casting of this statue. 3. 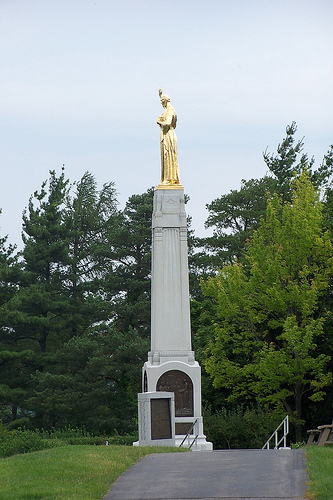 Torlief Knaphus is most famous for creating the Hill Cumorah Monument – [another Moroni statue] which stands atop the historic LDS site believed to be the location where Joseph Smith received the ancient Book of Mormon records [golden plates] from the angel Moroni. [Bonus trivia: This angel statue was the first designed holding the plates in it’s left arm. 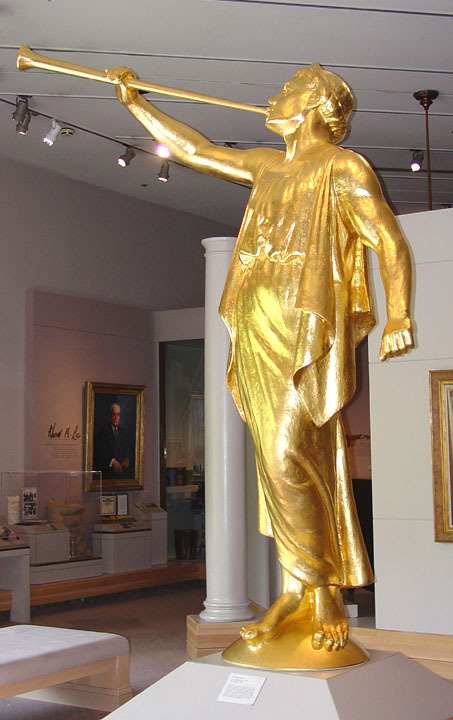 Today, 5 Temples have an Angel Moroni statue depicted holding the gold plates in its left arm – Los Angeles California, Washington DC, Seattle Washington, Jordan River Utah and Mexico City] Located near Palmyra New York, just southeast of Rochester, this is also the site of the annual Hill Cumorah Pageant. 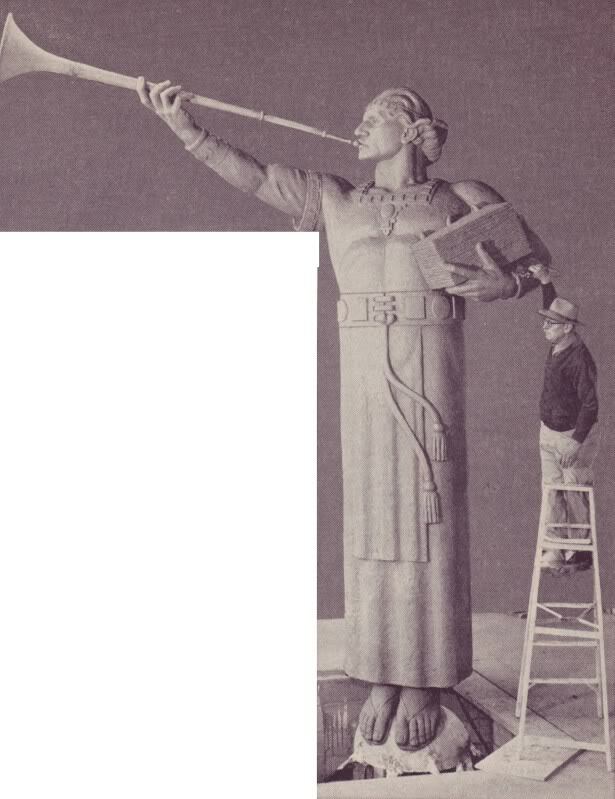 Torlief created a second Moroni statue design which was eventually used for the Idaho Falls, Atlanta Georgia, and Boston Massachusetts Temples. 4. Karl Quilter studied under Avard Fairbanks, and sculpted his first Angel Moroni in 1978. Two sizes were made, one 3 meters high, the other just over 2 meters. The Angel Moroni statues are traditionally turned to face East, to herald the 2nd coming of Jesus Christ. However, a handful of angel Moroni statues face West due to the orientation of the lots and the placement of the spires (or towers). These are the Seattle Washington Temple, Spokane Washington Temple, rebuilt Nauvoo Illinois Temple, and Taipei Taiwan Temple. The Monticello Utah Temple is the only temple to have had a white angel Moroni. 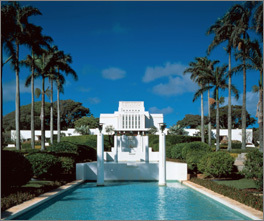 President Gordon B. Hinckley had envisioned all of the “smaller temples” to have a white enamel angel, however the Monticello experiment proved the white statue was too difficult to see, especially in cloudy weather. It was replaced about a year later by a larger, traditional gold-leafed statue, which remained the standard from then on. For various reasons, eight (8) current temples do not have an angel Moroni. They are the St. George Utah, Logan Utah, Manti Utah, Laie Hawaii, Cardston Alberta, Mesa Arizona, Hamilton New Zealand, and Oakland California Temples. One of the most beloved and popular Angel Moroni’s during the early 20th century did not top a temple – but rather, it crowned the Washington D.C. Chapel. This Mormon congregation had the distinction of having the only chapel adorned by a golden angel Moroni (an exact replica of Cyrus Dallin’s Salt Lake City Temple Moroni). The stone used to construct the exquisite chapel was taken from a granite quarry in Utah and transported to the nation’s capital. Dedicated on Nov. 5, 1933, this beautiful and unique building served the church for over 4 decades, until it was sold in 1975 to the Unification Church. The unique Chapel Angel was removed at that time, and is now displayed inside the Museum of Church History in Salt Lake City. The angel atop the newly constructed Oquirrh Mountain Temple was struck and blackened by lightning on June 13, 2009. Many people enjoyed poking jabs at this incident, and/or trying to devise some sort of “sign from God” theory. However, the plain and simple fact is that being the highest point on a very tall building, all Angel Moroni statues are frequently hit by lightning. They each include a lightening rod to protect the building, which emerges from the top of the statues head, and they also include special varnish to protect against extreme weather. The poor damaged Moroni was replaced successfully. The new one included an extra lightening rod, for extra protection. As of this publication date there are 130 Operating Temples, 8 Under Construction and 13 Announced – (click this link for monthly update). As stated above, 8 temples do not have an angel Moroni statue. That adds up to a lot of angel Moroni statues! The event of an angel Moroni being placed upon the top of a new temple is always a very exciting celebration. VIDEO: The Helsinki Finland Temple Thursday, October 13, 2005. Each Angel Moroni is a special symbol to the Latter-day Saints. They are a reminder of the miraculous and holy circumstances which surround founding events of the church, and a declaration of the Gospel of Jesus Christ being available and declared to all nations of the earth. Great article. Some points that could have been added include: 1) Which is the largests angel in weight and height. 2) Name of a chapel with an angel moroni on the steeple. 3)Which temples did not have an angel on them originally? I wish that you would have done this sooner so that I could have used the material in a youth conference presentation that I made last summer at the Washington DC Temple Visitors Center about how the Washington DC temple angel Moroni was different that other temples. An Angel Moroni statue adorned the top of the original Washington, D.C. Chapel. The Washington, D.C. Chapel was built in the 1930s and served as the meetinghouse for many LDS members working in the U.S. government. [Ezra Taft Benson, future Secretary of Agriculture and future Church president became the first stake president.] It was sold in 1975, but the angel Moroni and other artifacts from it are now displayed in the Museum of Church History in Salt Lake City. @Douglas – Sorry I didn’t accomodate you sooner, but glad you took the time to read! @Jake – thanks for sharing that! I don’t recall hearing about the Mt. Timp angel. It’s a bit odd that neither DesNews nor Mormon Times mentioned the prior angel being damaged by lightening when the Oquirrh Mt. angel was getting so much publicity. @ MormonBlogger – You are correct! That was a great tidbit I left off the article. My father used to attend the LDS chapel in Washington DC with the angel, and has many fond memories of his time there. The members were so proud of that unique chapel, and it was a marvelous missionary tool. 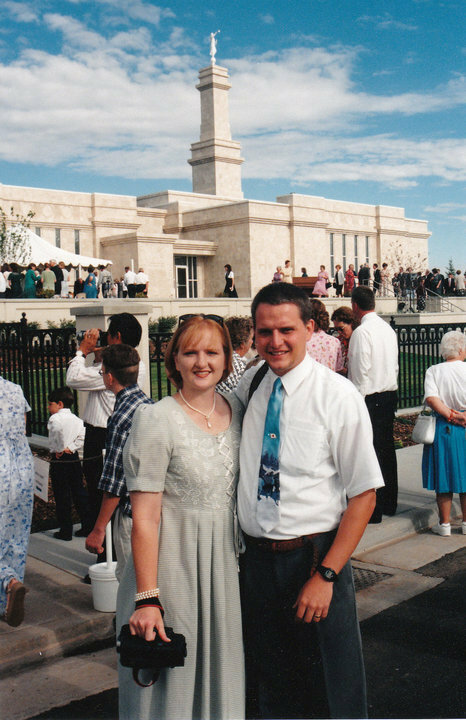 He says that they had non-Mormon visitors to the chapel every single week. People would be so curious, or impressed with the gold angel statue they would walk in, and then stay for the meetings. I am writing a personal history for my grandchildren. I am looking for pictures of the inside of the old DC chapel. If anyone has any, please let me know. Thanks. There’s one angle Moroni statue you’ve missed. At least the only one I know about. Possibly because it is no longer in place. 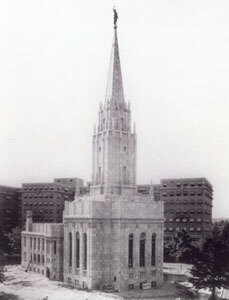 The Old Washington DC Ward building, sold by the church in the 1970’s, once had a Moroni statue on its spire. I think it was a smaller replica of the Salt Lake Temple’s statue. In 1971 when my family visited DC, we visited this chapel and I saw the statue myself. In the late 1970’s the statue was briefly on display in the DC temple visitors center and I understand it is currently in the chruch museum west of Temple Square. Just thought you’d like to know. So interesting! Seeing the angel Moroni up close before it is raised to the top of the temple is a very neat experience. I would recommend it to anyone. This was beautiful. I am post mormon, but I feel like I need an update occasionally. This must be a very emotional experience when seen in person. The close ups at the end, and the music by the taberbacle choir just added to everything. This is to Wendy:. Read the Book of Mormon on a daily basis and come back to Church. We love you and miss seeing your happy smiling face. “Lightning” is spelled incorrectly throughout the article ANGEL MORONI and LIGHTENING. Thanks John, The spelling errors have been corrected! Thank you so much for the great article. It had some information that I was looking for. I am related to Karl Quilter. (My great-grandmother was a Quilter.) I had heard about Karl and something about the angel Moroni. Thank you for clarifying it for me. I greatly appreciate it!!! Interesting about the west facing Moroni’s. I wonder how many face north and south. The Mexico City Moroni faces south. The missionaries that gave us a tour said Pres. Kimball requested him to awaken the Lamanites and face the book of Mormon lands. This angel also has the gold plates. And I think the Manhatten temple faces southwest since the temple is on a street corner. My son and I were trying to find a site that would tell us how high the Moroni on Temple square was from ground level. Any one know the answer to this? If you walked away from the temple wall, say 100ft and remained on level ground. If you could measure the angle from the ground looking up to the angel you could simply do this calculation: 100ft *(tan (put in measured degrees here)) = how high up the angel Moroni is. p.s. You’ll want to make sure your calculator is in degree mode, or you’ll get a wrong number. Also, this won’t be exactly right, as the angel Moroni isn’t directly over the East wall, but will give you a good estimate. You could also get a better estimate if you add to the initial 100ft how far in from the outer East wall you think the angel is before multiplying by tangent of the angle. Question: Can we pretty safely assume, then, that all the remaining temples not mentioned in the Dallin, Malin, Fairbanks, or Knaphus paragraphs, are adorned by the Quilter version? 2. You have posed an excellent question which I do not have an immediate answer for. It sounds like we have some sleuthing to do! If you find the answer before me, let me know – and vice versa. Thanks Eric – good detective work! Which temple cornerstone has an actual piece of Walt Disney’s classic Pinocchio? I’m considering putting it on Google Docs so that everyone can see it, and suggest improvements or corrections. If and when I do, I’ll let you know. Gosh, my best guess to your question, pre-Googling, would be the L.A. Temple. However, this answer would be wrong. The correct answer is interesting, and really rather obvious if you think about it. And the answer is. . . ? I understand that 5 temples have the angel moroni with the gold plates in his hand including the mexico city temple. Why is this so? Lance, you are correct. Only five temples at this time feature an angel Moroni statue holding a trumpet in one hand, and the gold plates in its other hand. These angels are located on the Los Angeles California Temple, Washington D.C. Temple, Seattle Washington Temple, Jordan River Utah Temple, and México City México Temple. A sixth angel Moroni holding plates stands atop the Hill Cumorah Monument. Every Angel Moroni statue is created as a unique work of art designed through inspiration. 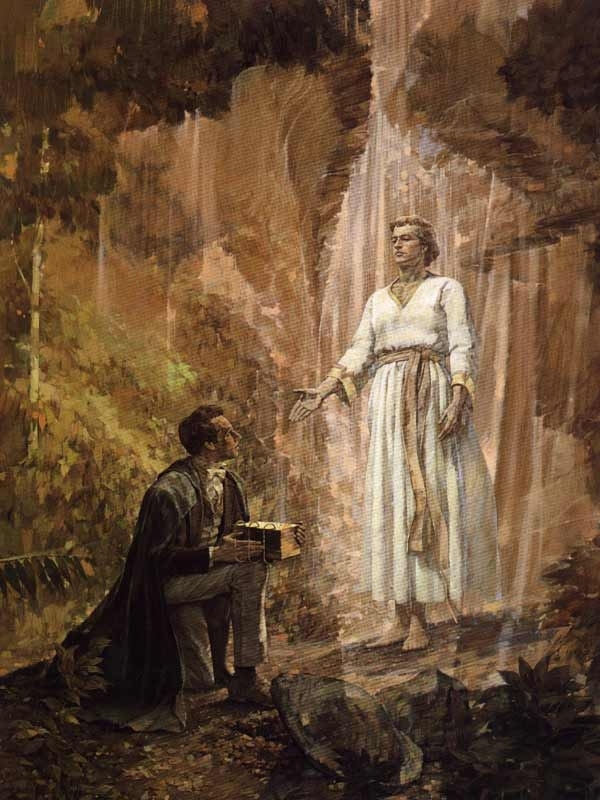 The choice to depict a Moroni holding the plates seems a perfect tribute to the prophet who sacrificed his entire life to preserve, protect and hide these sacred ancient records – and then to deliver them to Joseph Smith in the 19th Century. Although I do not have all of the details about each angel story, LA and DC angels are mentioned above. The Mexico City temple was the first temple built specifically for the decendents of the Lamanite people of the Book of Mormon, so I think it is especially fitting their angel is holding the golden plates! I hear the ball Angel Moroni stands on at SLC temple is actually a capstone of sorts that serves as a relic chamber containing historic church relics. Is this true do you know? Or what relics may be in there? I’m going to find out. I read it in a book and will find the source shortly. You might prove me wrong, but I don’t think there is “time capsule”-style stuff in there. Usually, those items are sealed into a cornerstone so that they can be (more-or-less) easily extracted later. Also, as you may know, the ball that the Angel Moroni stands on atop the Salt Lake Temple actually serves a practical engineering purpose. 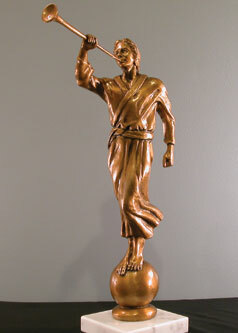 It is not actually a solid ball, but has a hole down the middle of it to allow a weighted pole attached to Moroni’s feet to swing a few degrees in every direction. So (unless I’m mistaken) I would think that it would be extremely tricky to pack very many items of historical significance into such a small, and oddly-shaped, space. Just my $0.02 cents, though. That’s an awesome article Kim! Glad to read there’s music included! Thanks for sharing. Jay, thanks for joining the discussion and sharing the reference. Always appreciated. I count 9 different designs when closely examining all the angel Moroni photographs I could find, yet this article only mentions 5 different designs. Perhaps you could research and find information on the other (4?). OK, Glen. Interesting. I’ll see what I can find. We can certainly open this up to all of our sleuth-readers. I also count 9 different Angel Moroni Styles. Here is what I have found. Eight temples have no Angel Moroni Statues. The Atlanta Temple used to have a #2 statue but now has a #6 Statue. The Monticello Utah Temple used to have a white #8 statue but now has a gold #6 statue. I would be interested in the lists! (kingsfold@gmail.com) Thanks! I also would be interested in the lists, I am working on som relevant projects. Hello Marilynn, Thank you for visiting. Please scroll back up and read item #1 under “Other Angels” which gives information about the Los Angeles Temple angel. “It has Native American features, wears a Mayan style cloak and holds the gold plates in his left hand.” Of course, no one actually knows what “Lamanite style clothing” actually looked like, but we can assume it had a close resemblance to styles found in “Aztec” art. It should be noted that East and West are not the only options for directions for Moroni to face. Chicago and Guatemala City Face North, Dallas and Buenos Aires face south, and Manhattan Faces the Lincoln Center, South West. This this cool Brian!!! Thanks for sharing. The following is a reference to another type of Angel which I use to share the Gospel with others. The reference is: Ensign 1984, Living by the Spirit by Joy Webb Rigby. Go to 2nd page if you do it on line; 1/2 way down a 2 line paragraph that starts out, “My husband and I…” Let me know what you think. Thank you, Thomas for recommending the article “Living By The Spirit” . The story you reference of a young girl who was sent a special “angel” [her mother] was very sweet. 🙂 I do hope that I can be that kind of mother for my children, and I do pray that we will all be a special angel for someone else. I have commented before on this fantastic post, but it is just the gift that keeps on giving. I have just finished an e-book in collaboration with Marvin Quist, who I met through the comment section of this very article. This ebook, which is free, details teh 8 different Moroni Statues in use on Temples, many statues that were considered for use but not used, plus other statues of Moroni that are not on temples. It lists facts, weights, heights, directions, and has a comprehensive listing of which statue is on each temple, among many other facts. Hi Brian, More than happy to post and share. This is great news! I’m sure my readers will enjoy the additional info. This has been a consistently popular and oft visited post. I was baptized in the Washington DC ward in 1968 and my first two sons where born and blessed there. There was a very wise and wonderful Bishop in the ward at that time. 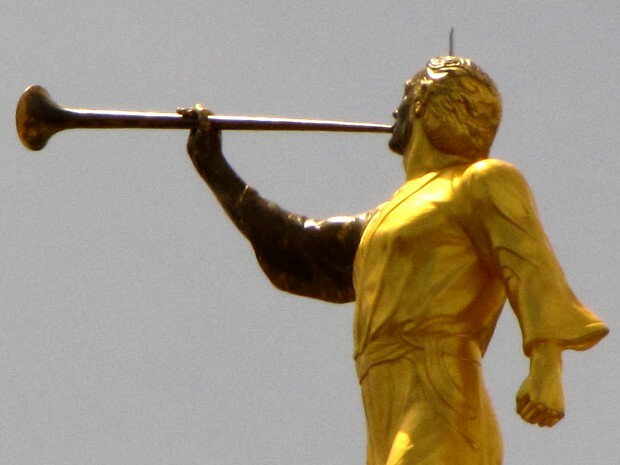 My favorite news item on the Angel Moroni statue is concerning the Cebu, PI Temple. During the recent Earthquake, the Statue rotated 15 degrees, with little other damage to the Temple. Question, did they correct the rotation or leave it as is. Hi Boyd, that’s a new story I haven’t heard. If you or another reader find more info be sure to share!